THE LIGHT CANNON eLED L1 IS AN UPGRADE TO THE LEGENDARY UK LIGHT CANNON. 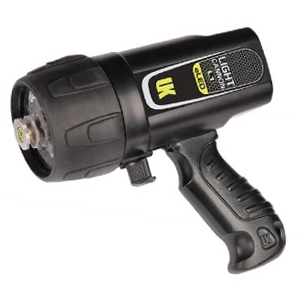 THIS LIGHT TRUELY LIVES UP TO ITS NAME, LIGHTING UP A NIGHT DIVE, WRECK DIVE OR ANY DIVE WHERE A STRONG PRIMARY LIGHT IS NEEDED. Carry the Light Cannon anywhere with ease with the standard lanyard and point using either pistol grip or lantern grip attachment. The Light Cannon now has two power modes for maximum flexibility and increased battery life. Power it up to 1100 lumens on high mode when more light is needed, and dial down to a still very powerful 440 lumens on low to conserve battery. UPGRADE TO THE RECHARGEABLE EDITION WITH THE RECHARGEABLE BATTERY PACK AND UP YOUR MAX LUMENS TO AN AMAZING 2100! The battery life of this light is an impressive max of 16 hours. It'll never leave you in the dark. 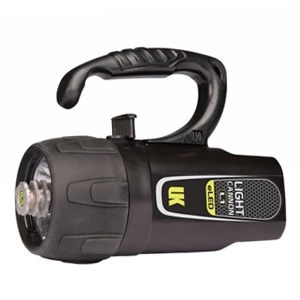 UK's patended LED cooling designs ensures the best performance underwater - this light is specifically designed to be the brightest in can be underwater.